Fort Worth’s Trinity Metro Board Chairman Scott Mahaffey has announced that Paul J Ballard, Trinity Metro president and CEO, will retire in April 2019. His retirement comes at the completion of his five-year contract. 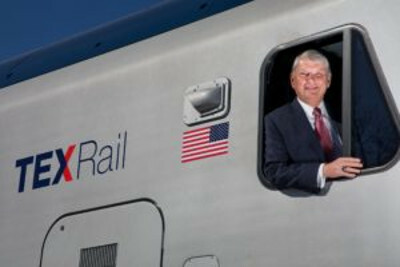 “Without Paul, the staff he assembled, and our dedicated Board members, there would be no TEXRail,” said Mahaffey. TEXRail is a 27-mile commuter rail line between downtown Fort Worth and DFW Airport, which is expected to open on January 5, 2019. Ballard has served 46 continuous years as a general manager, chief executive officer, or president of transit systems in public and private sectors. Before joining Trinity Metro, he led the startup of the Tennessee Music City Star commuter train. Ballard started his career as a brakeman and trainman on the Boston and Maine Railroad, and served as a bus operator and supervisor of public transit before becoming one of the youngest transit systems general managers in the country. While serving in the private contract management industry, he oversaw management of public systems in 47 U.S. cities and 17 states and provided management and consulting services internationally. Ballard has held leadership positions in the American Public Transportation Association and participated in activities of the National Transportation Research Board, most recently evaluating new transportation research projects seeking federal funding.